Drinking steaming hot tea has been linked with an increased risk of oesophageal (food tube) cancer, Iranian scientists have found. The British Medical Journal study found that drinking black tea at temperatures of 70C or higher increased the risk. Experts said the finding could explain the increased oesophageal cancer risk in some non-Western populations. Adding milk, as most tea drinkers in Western countries do, cools the drink enough to eliminate the risk. The oesophagus is the muscular tube that carries food from the throat to the stomach. Oesophagus cancers kill more than 500,000 people worldwide each year and oesophageal squamous cell carcinoma (OSCC) is the most common type. Tobacco and alcohol are the main factors linked to the development of oesophageal cancers in Europe and America. But it has not been clear why other populations around the world have high rates of the disease although there has been a theory that regularly drinking very hot drinks damages the lining of the gullet. There was no association between the amount of tea consumed and risk of cancer. Because the researchers had relied on study participants to say how hot their tea was, they then went on to measure the temperature of tea drunk by nearly 50,000 residents of the same area. This ranged from under 60C to more than 70C, and reported tea drinking temperature and actual temperature was found to be similar. 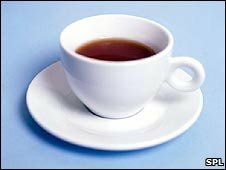 Writing in the BMJ, the researchers led by Professor Reza Malekzadeh, said: "Our results showed a noticeable increase in risk of oesophageal squamous cell carcinoma associated with drinking hot tea. "A large proportion of Golestan inhabitants drink hot tea, so this habit may account for a substantial proportion of the cases of oesophageal cancer in this population." Previous studies from the UK have reported people prefer their tea to be about 56-60C - cool enough not to be risky. In a BMJ editorial, David Whiteman from the Queensland Institute of Medical Research in Australia said: "The mechanism through which heat promotes the development of tumours warrants further exploration and might be given renewed impetus on the basis of these findings." Dr Whiteman advised tea-drinkers to simply wait a few minutes for their brew to cool from "scalding" to "tolerable". Oliver Childs, a spokesman for Cancer Research UK, said: "Tea drinking is part of many cultures, and these results certainly don't point to tea itself being the problem. "But they do provide more evidence that a regular habit of eating and drinking very hot foods and drinks could increase your risk of developing cancer of the oesophagus." 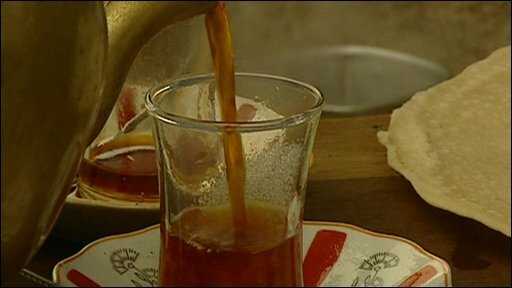 He added: "People in this region of northern Iran often drink very hot tea as part of their daily routine. We're a nation of tea lovers in the UK, but we don't tend to drink tea at such high temperatures and we usually add milk, which cools it down."